GOLD INVESTING prices popped higher Tuesday lunchtime in London, gaining $5 per ounce above the $1300 mark as European stock markets slipped amid the relentless Brexit uncertainty, and crude oil paused its surge to 5-month highs. Silver also hit near 2-week highs, touching $15.34 as the US Dollar fell on the FX market, while platinum prices held flat at last weekend's 10-month highs above $900. 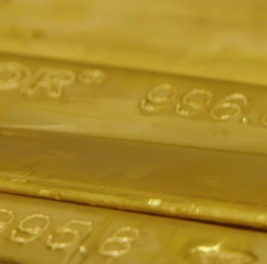 Shanghai gold prices overnight extended their premium to London quotes, fixing on Tuesday with an incentive for new bullion imports into the world No.1 consumer nation of more than $16 per ounce. 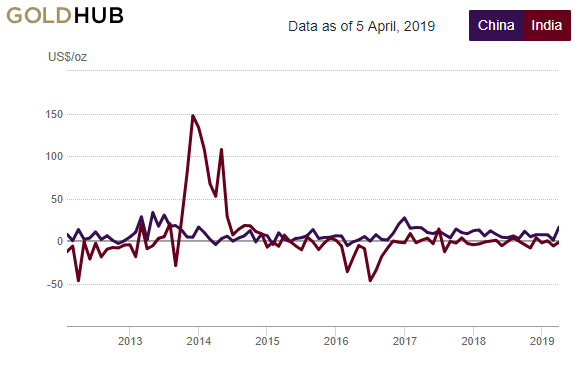 Last week saw the Shanghai premium average $15.50 per ounce according to data from the mining industry's World Gold Council – the highest weekly average since Christmas 2017. Prices in gold's No.2 consumer India meantime ended last week with a premium of $2.60 on the WGC data, but continue to show an average $2.90 discount per ounce for 2019 to date on weak retail demand or jeweler stockpiling. 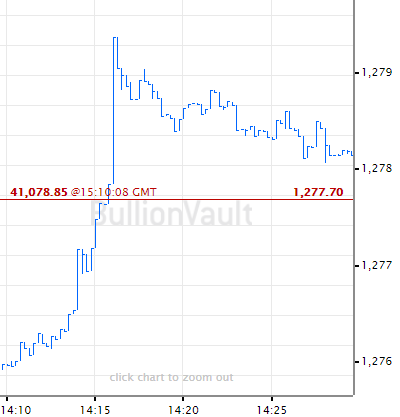 "Gold seems to be supported for now on dips towards $1285-90," says the latest trading note from Swiss refiners and finance group MKS Pamp, noting solid Chinese bank demand "but we are looking for ETF buying to pick up momentum to confirm a more bullish outlook." The world's largest gold-backed ETF however – the giant SPDR Gold Trust (NYSEArca: GLD) – shrank again on Monday as investor selling saw a net 0.2% liquidation of the exchange-traded gold fund. That marked the 6th consecutive day of outflows from the GLD, matching its 2 longest stretches of net liquidation since Trump's election victory in November 2016. Investors in Europe, in contrast, have now "piled more than $1.4 billion of net new assets into gold exchange-traded products so far this year," says a note at ETF Express, quoting figures from product providers Invesco. "Investors now hold more than ever in gold [ETF] products listed in Europe," the note goes on, "roughly double since December 2015, when gold was at its lowest price in almost a decade." Gold priced in Sterling today rose within 60p of £1000 as UK Prime Minister May met with Germany's Chancellor Merkel ahead of tomorrow's emergency European Union summit on extending the Brexit deadline. With all remaining 27 EU states needing to agree, France's President Macron will reject any extension beyond December, according to a BuzzFeed report, and also "wants checkpoints every three months to ensure the UK is not disrupting EU business." European exports to the United States now face $11bn in trade tariffs, the US Treasury said overnight, in retaliation for unfair state aid to the Airbus aerospace company as repeatedly identified by the World Trade Organization. 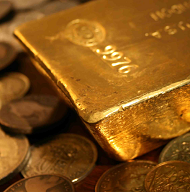 Gold investing prices in Euro terms today edged up to €1159 per ounce, also the highest in nearly 2 weeks.